PALU, Indonesia (AP) — From the mountain range, the bay was a sparkling blue and the small city huddled around it a mosaic of bright buildings and mosque minarets. Suddenly a blaring siren and clouds of dust shattered the tranquility. An ambulance bumped along a dirt road, racing to the top. An idle excavator whirred into life. People, some wearing surgical masks, others with scarfs across their faces, walked toward a wide mass grave dug into the flat top of the range. “How many?” shouted a man, running to the ambulance as it drove by. “Two,” a voice replied. The ambulance backed toward the shallow end of the trench. Two men jumped out. With tight, serious expressions on their faces they opened the back and struggled with the two body bags inside. They pulled out a black body bag emblazoned in red with the acronym of the search and rescue agency and stumbled across the uneven floor of the grave, carrying it to its resting place. Then they brought the second. The excavator scooped up a load of dirt, swung toward the trench, and its articulated arm and bucket, moving almost elegantly, dropped the earth over the bags. 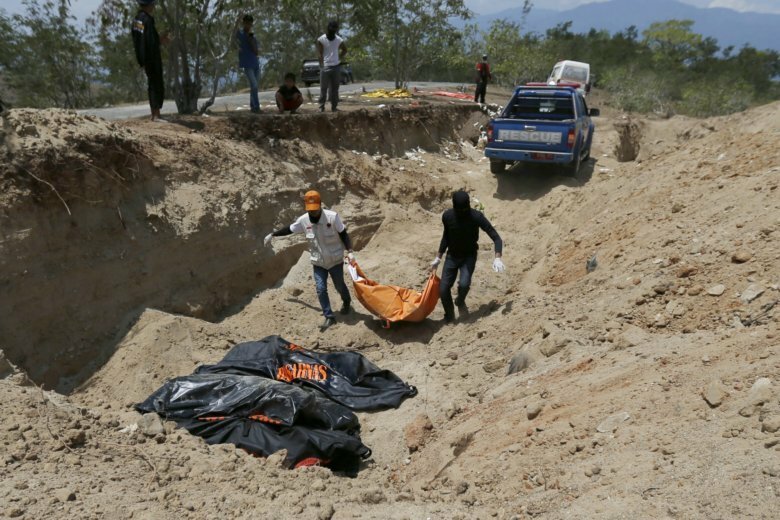 The bodies were found at Talise, a popular beach in the Indonesian city of Palu that was struck by a magnitude 7.5 earthquake and powerful tsunami on Sept. 28. Officials say more than 1,500 people were killed. Miles (kilometers) of coastline were obliterated by tsunami waves that swept away people, smashed houses off their foundations, beached ships and overturned trucks. Volunteers said the two bodies were brought directly from the beach. Due to advanced decomposition, authorities are no longer trying to identify who they find in the rubble. Minutes before the ambulance arrived, Septi Eka Saputra had left. Before that he’d spent a long time staring at the ground littered with medical gloves and face masks, wondering if his younger sister would end up there. She was at the Roa Roa hotel in Palu, meeting friends when the earthquake hit, shattering the concrete structure beyond recognition. He said friends had told him her body, if found, could be brought to the mountain. He’d got information that four from the hotel were being delivered. Forty-five minutes after the first ambulance arrived, another made it up the dusty road, delivering a body in a bright yellow bag. Within minutes another came, this time the body bag was orange and emblazoned with an Indonesian Red Cross logo. Foreign reporters and their local assistants crowded around one of the volunteers. A sweaty European journalist wanted to know how many bodies were expected Friday. “Yes but how many today?” he barked at his translator. One of the volunteers, Muhamad Ardi, didn’t want to talk. Everyone was standing on top of the recently buried, he said. On an embankment next to where reporters, soldiers and the grieving were milling, a dark meter-wide splotch had formed. But 48-year-old Asep Junaedi patiently answered everyone’s questions, his voice often quavering with emotion. Including six bodies brought on Friday morning, there were 643 people buried in the mountaintop grave, he said, filling up most of what had been a 30-meter (100-foot) -long space. He and Ardi had been handling bodies for four days, he said. Another vehicle arrived. “Zero,” shouted a soldier, laughing. Meters away, two women, each with a child missing, discussed whether it would be right to open the bags. One said she’d look everywhere. The second said she couldn’t bear that to be the last memory. Some of the people left. The bay glistened. And the call to prayer rang out from Palu.